Bruce H. Vanderlaan, Attorney at Law, P.A. 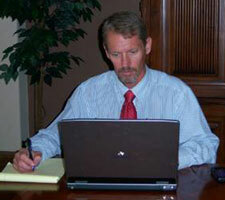 is my law firm dedicated to serving small to medium sized businesses and health care professional practices. No one cares more about their clients than I do. I have negotiated contracts while skiing and evaluated business opportunities for clients while on vacation. I will be there when you call. I have a Bachelor of Science in Business Administration, and graduated with honors from law school in 1992. Along the way, I did additional coursework at The University of Strathclyde in Glasgow, Scotland. After law school I started practice with Varnum, Riddering, Schmidt & Howlett, which was then the largest law firm in West Michigan. I finally wised up and made the move to sunny and warm Southwest Florida with my wife Nicole, who is a Physician Assistant at Florida Heart Associates, and daughter, where we can take advantage of living outdoors and spending time on the water. My family was in business while I was growing up, and I started working in the family business at age nine. I’ve been a teacher, a teamster, a farmhand, a businessman, and a lawyer. I’ve seen the problems you face. Whether you are a small business owner interested in making your business stronger, or an individual who wants to protect your family and your assets, you need an attorney who knows from experience what you want, what you need, and what you are going through. We made a choice to live here, raise our family here, to be an employer here, and to be part of this community. I am a resource…for your small business or health care practice. You can have an attorney whose business is protecting your business. I act as a true consigliere for my clients. I provide advice and counsel not only for legal decisions, but help with life’s issues as well, connecting my clients with those who meet their needs, from plumbing to pest control to banking and cleaning.